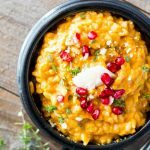 Creamy, zingy, comforting and filling, this Pumpkin Goat Cheese Risotto with Pomegranate is everything you need on a cold Fall or winter night. You guys need to try this Pumpkin Goat Cheese Risotto with Pomegranate like yesterday! It has everything – an intense creaminess and a little tartness from the goat cheese, earthiness from the pumpkin, and a nice little sweet surprise that complements the whole dish just perfectly when you bite into the fresh pomegranate. Now if you have been following along for a while you will know that I am a fan of the quick and easy, set and forget type of dinner. Even when it comes to traditionally labor intensive dishes such as risotto. You just have to look at my Baked Brown Rice Risotto or my Creamy Edamame and Spinach Risotto in the Pressure Cooker and you will get the gist. I am all about the ease of the dish, especially on a weeknight. If you give it a try be sure to pop back and leave a comment to let me know how you went, I just love to hear from you! Happy Eating! Add the stock and pumpkin into a medium saucepan and whisk together over a medium heat. Bring to a simmer, reduce the heat to low and cover. Melt the butter in a large saucepan over medium heat. Once hot, add the shallot and cook until softened. Add in the thyme and rice and cook for one minute. Add the white wine vinegar and a ladle of the warm stock/pumpkin and cook, stirring occasionally, until the liquid has evaporated. Add another ladle of stock, and continue cooking until evaporated again. Continue cooking, adding a ladle of stock at a time, and allowing to evaporate in between each addition. Cook until the rice is done, but has a bite to it, about 20-25 minutes. Once cooked, add in the parmesan, parsley and half of the goats cheese and season to taste with salt and pepper. Top with the remaining goat cheese and pomegranate arils. Serve immediately. Never had a risotto but I love goat cheese and now this combo has upped the ante for me to try it especially with how easy and quick yours looks to cook. Love your colors! What a beautiful Fall dish! Can’t wait to give this a try and add some color to the dinner table. I especially love your addition of pomegranate seeds on this risotto. So delightful! I love risotto and this sounds divine! Great photos too! If it tastes even half as good as it looks I am sold! this left me drooling!such creamy delicious bowl.yum! i really love the versatility of pumpkin. Saving this for later, I am trying to incorporate more veggies in my diet. Thanks for the recipe! Well this is definitely an easy way to get a lot of pumpkin into a cozy comfort dish! Oh my GOODNESS – I want to dive into this bowl! It looks so lusciously creamy, and those pops of tart pomegranate on top have my mouth watering. Yum! The pomegranate definitely makes it!! I make risotto all the time but never your delicious creamy version. I love that you added pumpkin and goat cheese. Your photos are beautiful and DE-LISH!! Risotto is a staple in our kitchen, being Italian, and I really like this flavor combination. oh this Pumpkin Goat Cheese looks so delicious… wish I had some right now! Hmmm… interesting to add pomegranate. That adds some cool flavors. I might have to try this. The pomegranate makes it, trust me 🙂 Little surprising sweet pops in all that earthy pumpkin and rice – so good! Aside from the fact that you’ve got some beautifully festive holiday colors and flavors in this dish, I commend you on the traditional method of making risotto. It’s my preferred method — I sip a glass of wine while I stir and generally the wine is gone when the risotto is ready – or is it the reverse? Who cares. It’s wine and risotto.